(Nanowerk News) As in Alice's journey through the looking-glass to Wonderland, mirrors in the real world can sometimes behave in surprising and unexpected ways, including a new class of mirror that works like no other. As reported today in The Optical Society's (OSA) new high-impact journal Optica ("Optical Magnetic Mirrors without Metals"), scientists have demonstrated, for the first time, a new type of mirror that forgoes a familiar shiny metallic surface and instead reflects infrared light by using an unusual magnetic property of a non-metallic metamaterial. By placing nanoscale antennas at or very near the surface of these so-called "magnetic mirrors," scientists are able to capture and harness electromagnetic radiation in ways that have tantalizing potential in new classes of chemical sensors, solar cells, lasers, and other optoelectronic devices. 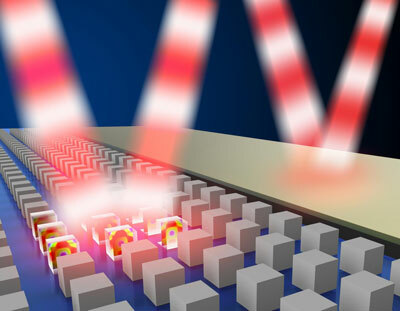 "We have achieved a new milestone in magnetic mirror technology by experimentally demonstrating this remarkable behavior of light at infrared wavelengths. Our breakthrough comes from using a specially engineered, non-metallic surface studded with nanoscale resonators," said Michael Sinclair, co-author on the Optica paper and a scientist at Sandia National Laboratories in Albuquerque, New Mexico, USA who co-led a research team with fellow author and Sandia scientist Igal Brener. These nanoscale cube-shaped resonators, based on the element tellurium, are each considerably smaller than the width of a human hair and even tinier than the wavelengths of infrared light, which is essential to achieve magnetic-mirror behavior at these incredibly short wavelengths. "The size and shape of the resonators are critical," explained Sinclair "as are their magnetic and electrical properties, all of which allow them to interact uniquely with light, scattering it across a specific range of wavelengths to produce a magnetic mirror effect." Conventional mirrors reflect light by interacting with the electrical component of electromagnetic radiation. Because of this, however, they do more than reverse the image; they also reverse light's electrical field. Though this has no impact on the human eye, it does have major implications in physics, especially at the point of reflection where the opposite incoming and outgoing electrical fields produce a canceling effect. This temporary squelching of light's electrical properties prevents components like nanoscale antennas and quantum dots from interacting with light at the mirror's surface. A magnetic mirror, in contrast, reflects light by interacting with its magnetic field, preserving its original electrical properties. "A magnetic mirror, therefore, produces a very strong electric field at the mirror surface, enabling maximum absorption of the electromagnetic wave energy and paving the way for exciting new applications," said Brener. Unlike silver and other metals, however, there is no natural material that reflects light magnetically. Magnetic fields can reflect and even bottle-up charged particles like electrons and protons. But photons, which have no charge, pass through freely. "Nature simply doesn't provide a way to magnetically reflect light," explained Brener. Scientists, therefore, are developing metamaterials (materials not found in nature, engineered with specific properties) that are able to produce the magnetic-mirror effect. Initially, this could only be achieved at long microwave frequencies, which would enable only a few applications, such as microwave antennas. More recently, other researchers have achieved limited success at shorter wavelengths using "fish-scale" shaped metallic components. These designs, however, experienced considerable loss of signal, as well as an uneven response due to their particular shapes. To overcome these limitations, the team developed a specially engineered two-dimensional array of non-metallic dielectric resonators?nanoscale structures that strongly interact with the magnetic component of incoming light. These resonators have a number of important advantages over the earlier designs. First, the dielectric material they use, tellurium, has much lower signal loss than do metals, making the new design much more reflective at infrared wavelengths and creating a much stronger electrical field at the mirror's surface. Second, the nanoscale resonators can be manufactured using standard deposition-lithography and etching processes, which are already widely used in industry. The reflective properties of the resonators emerge because they behave, in some respects, like artificial atoms, absorbing and then reemitting photons. Atoms naturally do this by absorbing photons with their outer electrons and then reemitting the photons in random directions. This is how molecules in the atmosphere scatter specific wavelengths of light, causing the sky to appear blue during the day and red at sunrise and sunset. The metamaterials in the resonators achieve a similar effect, but absorb and reemit photons without reversing their electric fields. Confirming that the team's design was actually behaving like a magnetic mirror required exquisite measurements of how the light waves overlap as they pass each other coming in and reflecting off of the mirror surface. Since normal mirrors reverse the phase of light upon reflection, evidence that the phase signature of the wave was not reversed would be the "smoking gun" that the sample was behaving as a true magnetic mirror. To make this detection, the Sandia team used a technique called time-domain spectroscopy, which has been widely used to measure phase at longer terahertz wavelengths. According to the researchers, only a few groups in the world have demonstrated this technique at shorter wavelengths (less than 10 microns). The power of this technique is that it can map both the amplitude and phase information of light's electric field. "Our results clearly indicated that there was no phase reversal of the light," remarked Sheng Liu, Sandia postdoctoral associate and lead author on the Optica paper. "This was the ultimate demonstration that this patterned surface behaves like an optical magnetic mirror." Looking to the future, the researchers will investigate other materials to demonstrate magnetic mirror behavior at even shorter, optical wavelengths, where extremely broad applications can be found. "If efficient magnetic mirrors could be scaled to even shorter wavelengths, then they could enable smaller photodetectors, solar cells, and possibly lasers," Liu concluded.